X-Calibur has entered into an exclusive agreement with ISO 1 Group who are headquartered in Baku Azerbaijan to distribute the full range of X-Calibur products in Azerbaijan. 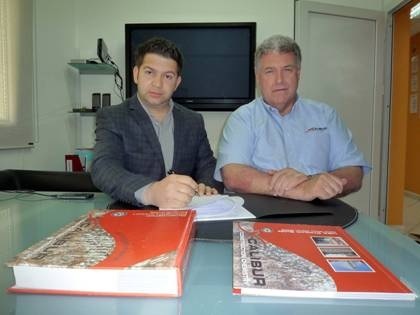 X-Calibur Group Managing Director Brian Davies and ISO 1 Group Managing Director signed the agreement on the 6th May 2012 at X-Calibur's Arab, Asia & Africa Regional HQ in Sharjah Airport Free Zone in the United Arab Emirates. X-Calibur International FZC have signed a manufacturing licence with Neeltra International for Trading & Investment Co. Ltd. who are based in Khartoum for the production of admixtures and other chemicals used in the production and casting of concrete . A production company has been formed specially for this investment Neetra X-Calibur Concrete Admixtures Co Ltd will begin producing admixtures at its new production facility by the end of May 2012.